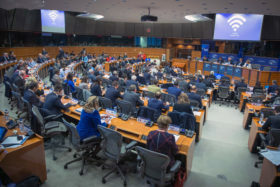 The European People’s Party (EPP) Political Assembly met in Brussels on 4-5 February to discuss the European elections, the political situation in Venezuela, Brexit and, among others, the female inclusion in the ICT sector. The members also elected the head of the party’s new ethical committee. EPP Spitzenkandidat Manfred Weber attended the meeting and presented his Europe-wide Listening Tour. He emphasized the importance of considering the people’s concerns and including them in the party manifesto and priorities for the EU elections. “Venezuela is at a turning point. After the devastating effects of Maduro’s regime on Venezuela’s people, their society and economy, a new future is now possible. Juan Guaido represents a new horizon of democracy, freedom and respect of human rights for Venezuela. And this is why the EPP recognises Juan Guaido as Venezuela’s interim President.” Read the full resolution here. Brexit also topped the discussions as EU Chief Brexit negotiator Michel Barnier presented the state of play. The members of the EPP Political Assembly also adopted a resolution on women’s role in the digital transformation of our economy and our society, urging the European Commission to make the inclusion of women in the digital transformation of our society and economy a key priority for the next European budget. The paper also stresses the need to remove gender-based barriers and obstacles to the digital labour market as well as to encourage female entrepreneurship in the digital world through gender-equality target actions. Read the full resolution here. The EPP Political Assembly also elected EPP Vice-President Paulo Rangel as Chair of the party’s new Ethics Committee. The task of the newly established Ethics Committee is to draft a Code of Conduct for the EPP and its members, reaffirming its commitment to fight against corruption and conflicts of interest on all levels. The Ethics Committee shall establish whether the Code of Conduct has been complied with or – in cases of infringement – propose appropriate measures. The other members of the Ethics Committee will be appointed at the next Political Assembly. Finally, the EPP members held a minute of silence in memory of Paweł Adamowicz, the Mayor of Gdańsk.